Save 10% Off Irrigation System Installation! Animal Trapping – Raccoons, Squirrels, Groundhogs etc. We know our name is only as good as our results. That’s why your lawn will be analyzed, diagnosed, and treated by Lawn Service professionals. Oasis has been providing Plant Health Care services since 1989. Proper fertilization takes planning, skill and a bit oFert Pic For Sitef important knowledge. 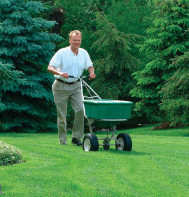 The keys to success include fertilizing on a regular schedule, using the right materials and applying just the right amount – not too much, and not too little. Our team members are trained to do just that. Lawns should be fertilized throughout the year, but the final treatment in fall is the most vital to your turf’s overall health. A boost of nutrients now will give your grass what it needs to grow new and stronger roots before going dormant for the winter. The end result is a lawn that is greener earlier in the year, less susceptible to winter and spring diseases and resistant to stress from summer heat and drought. There are several lawn diseases that are problematic in Central Missouri. Some are relatively harmless, while others can destroy your entire lawn in a very short time. Most lawn diseases are caused by fungi that live off your grass and are spread by foot, water, and air. They often affect your lawn in spots, circles, patches, and/or strange colors ranging from brown, to yellow, to red. The blades of grass may show tiny black spots, grey or brown lesions, or yellowing. Lawn fungus is most common when we have conditions of high humidity and high temperatures. Having poor drainage will also increase the probability of having diseases. Following a regular fertilization schedule along with fungicide applications is the best way to rid your lawn of fungus. If you recognize any of the fungi shown in this picture, it may be time to give us a call! 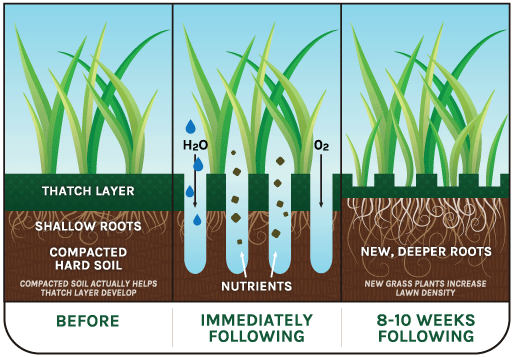 Aeration is vital because it ensures that air and water are able to penetrate any thatch or compacted soil and get to the root system of your turfgrass. Over time, soil becomes compacted, preventing proper circulation of air, water and nutrients within the soil. Excess lawn thatch can also starve the roots from these essential elements. Perforating the soil with small holes (aeration) to allow air, water and nutrients to penetrate the grass roots is the best way to alleviate compaction and break down any excess thatch. The best time for aeration is in the fall (during the growing season), when the grass can heal and fill in any open areas after soil plugs are removed. Overseeding right after aeration is a great way to augment the thickening process. Like all living things, your lawn’s health depends on water, air and nutrients. Proper aeration ensures a healthy lawn for years to come. While we will gladly perform this service, we recommend the benefits of core‐plug aeration. Please call Mollie in the office at 573‐446‐0858 for more details. 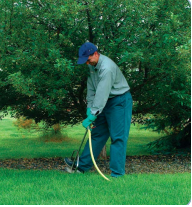 Discovering grub & other insect damage in your lawn is bad news. Grubs feed on the roots of your lawn, causing many dead patches. Repairing your lawn every fall is unnecessary. Grubs are the larval stage of many types of beetles. The beetles lay their eggs in your lawn and the newly hatched worms work their way into the soil, where they feed on the roots of grass and other plants. Because beetles lay their eggs in mid‐ to late‐summer, the young grubs cause the greatest damage during the fall months. Grubs won’t disappear on their own. They should be treated before damage begins to appear, or as soon as they’re discovered. When discovered early enough in the year, our Scotts Grub Ex applications will provide control of the grubs in your lawn. 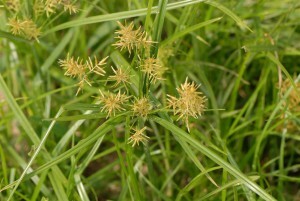 Nutsedge is a yellow‐greenNutsedge, tri‐bladed grass‐like weed that grows much higher than your lawn. This growth can occur only a few days after the lawn has been mowed. Optimal soil conditions for Nutsedge growth are: moist, poorly drained, heavy clay. That is the exact definition of most of the lawns we care for, especially with the heavy rain this Spring and Summer. We typically treat Nutsedge from July through September. There is an additional charge to spray for this weed as it is not included in your yearly lawn maintenance program. The average price range is $30 – $60 depending on the mass of population in your lawn. This is an approximate cost and we can give you a more definitive price before services are provided. It’s never too late to save your lawn! To stay happy and healthy, your trees and shrubsShrub Fert need an extra meal this time of year. Just like your lawn, the larger elements of your landscape are hungry too, and a round of fertilization will give them a head start going into winter and spring. Late fall is a great time to feed your trees and shrubs, as the roots are still actively absorbing nutrients, allowing the plants to store them up over winter. When spring comes, those nutrient reserves will be used to create new growth. Since they need so little attention, why not give your trees and shrubs what they need to maintain their place as your landscape’s most valuable members. Don’t let pesky bugs or diseases ruin you beautiful landscape! Give us a call and we’ll take care of it! 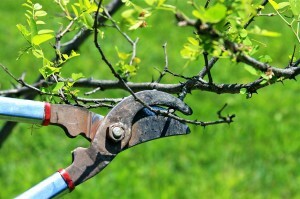 Like fertilization, properPruning Pic pruning is essential for newer plantings, and more mature trees can benefit greatly as well, especially if the plant has suffered any damage from summer storms or was not pruned early in its growth. Pruning promotes ideal growing patterns by removing weak or crowded limbs and creating a properly shaped crown. While pruning of younger plantings can easily be done without specialized equipment, it is always best to call a trained professional if larger trees need to be cut back. We would be happy to help! We’re the best mole trappers in town! Animal Trapping – Raccoons, Squirrels, Groundhogs, etc. Not just moles, we’ll take care of any vermin pestering with your lawn! There’s a lot to consider in keeping your lawn and landscape in top condition. Most properties have a wide variety of trees, shrubs and lawn areas, along with flower and mulch beds in all sizes, shapes and kinds. Including all of these areas in a maintenance plan will lead to your property looking its best. Plus, this usually means fewer problems and less money spent in the long run! The key is to plan for the right maintenance services at the right times. Give us a call and we’d be happy to help you establish a landscaping plan that will have your lawn looking its greenest! Contact Mollie in the office at 573‐446‐0858 to learn more about any discounts you may be eligible for! © 2018 BY OASIS LANDSCAPES & IRRIGATION. ALL RIGHTS RESERVED.